PREMIUM FOODS BASED ON NATURE. Using nutritional science, Zignature has been formulated to go above and beyond conventional dry dog foods to deliver healthy, protein-packed goodness in every savory bite. Each formula contains a unique, single source protein, making the food excellent for dogs with possible allergies or food sensitivities. Zignature never uses any chicken, chicken eggs, or chicken by-products in its food as chicken is one of the most common potential canine allergens. Zignature’s recipes are limited ingredient diets and contain no potatoes. 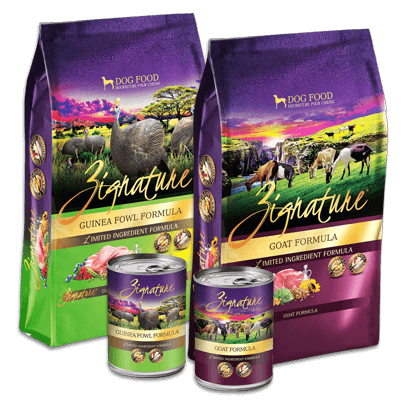 With delicious protein choices like goat, venison, lamb, kangaroo, salmon, and catfish, your dog or puppy is sure to go wild for Zignature’s nature inspired formulas.